Realistic Games began operations in 2002 and has grown to great heights since then. The firm has a base in Reading, Berkshire, but its casino operations come from Gibraltar nowadays. Not only does it boast industry-respected rewards for its games, but it also prides itself on innovation. It recently released a pair of 3D titles that set it aside from its main competitors. Keep reading to find out more about this company that supplies many of your favourite UK casino sites. Discover the games it produces and the features that make them so recognisable. In 2002, Realistic Games launched and set about creating mainly table games for big name casino sites. The business came together after a meeting of casino operators, virtual gaming producers and those who had dabbled in gaming terminals in real life venues. At first, the company relied on third party platforms to offer their products to big name clients, such as Paddy Power and William Hill. However, it soon became obvious that this was not a practical, cost-effective solution. It set about creating its own distribution platform. In 2011, it launched the Realistic Games Library (ReGaL), and started powering new casinos sites on its own. You can play titles from Realistic Games at Casino Heroes. It soon began to push to find the newest advances in gaming technology, in order to stay ahead of the industry curve. It quickly pinpointed HTML5 as a method of creating slick mobile offerings, rather than the clunky Flash. Realistic Games was at the forefront of this industry shift, which is now standard. In another display of forward thinking in spring 2018, Realistic Games created Black Ice, a 3D slot in which players can shift the angle at which they watch the action. Later that year, it released Realistic Roulette, which brought the 3D theme into the table game arena. You can find out more about both of these titles below. Realistic Games has a great reputation for its slots games. The firm always creates with mobile in mind, which suits the way we consume our gaming. 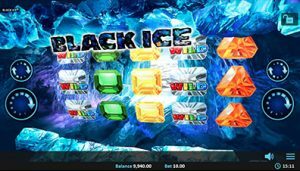 Black Ice is a five-reel, ten-payline slot set in an atmospheric ice cave. The imagery is spot on and you can almost feel the chill when you play. To further add to this effect, you can virtually wander through the scene using the 3D technology. It is Realistic’s first foray into 3D and it works a treat. Use the mouse or tip your device to try out all of the different angles, as the chilly jewels whizz by on the reels. Winning lines bring free respins, during which all winning symbols turning Wild. Of course that means that, if you pick up another win, you earn even more Wilds, helping you win some more. This notable and exciting slot offers a cool 250x your stake as a top prize, which is not to be sneezed at, even if you are feeling the cold. 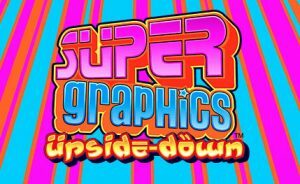 Super Graphics Upside-Down was nominated for a prestigious EGR Operator Awards Game of the Year gong in 2013. It is a fun Japanese-themed slot with five reels and 20 paylines. The game has an intriguing issue at the heart of it. You earn the big wins by hitting the 7s and the Wilds, but they all stand on the right hand reels. Wins are paid from the left, making it less likely that you will benefit. However, if you land a minimum of three Super Graphics symbols, the reels flip upside down, leaving the good stuff on the left. You get 15 free spins in this mode, with the chance to retrigger. The top prize in the game is 5,000 times your line bet, and all the while, your host Satsuki guides you through the action. It is unlike anything else on the market and it is obvious to see why the awards judges enjoyed it so much. Table games were the main thrust of the firm’s business in the early day, and they continue to produce high quality titles for fans of roulette, blackjack, baccarat and more. 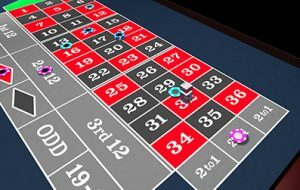 Realistic Roulette takes the 3D technology of Black Ice and puts it firmly onto the casino floor. You can scout around the table for the best possible view of the action, as if you were in a bricks and mortar casino. The company has invested a lot of effort into capturing perfectly the way the balls spin. The action is very lifelike and bridges a gap between virtual roulette, live dealer games and the land-based experience. Find out more about Realistic Roulette on the dedicated page. The newfound use of 3D is certainly a distinguishing feature of Realist Games’ work. Having launched it in Black Ice to great effect, the company took it to roulette. It has shown that it can work across a range of games and will continue to innovate and advance the technology. As the worlds of virtual and augmented reality encroach further into our lives, this use of 3D is a way of online casino play keeping up. Sometimes players want more that simply watching a computer ball whirr round a computer wheel. The chance to influence the way they witness it, and interact with the action is most welcome. Visit Casino Heroes now to play Realistic Games’ slots and table games.